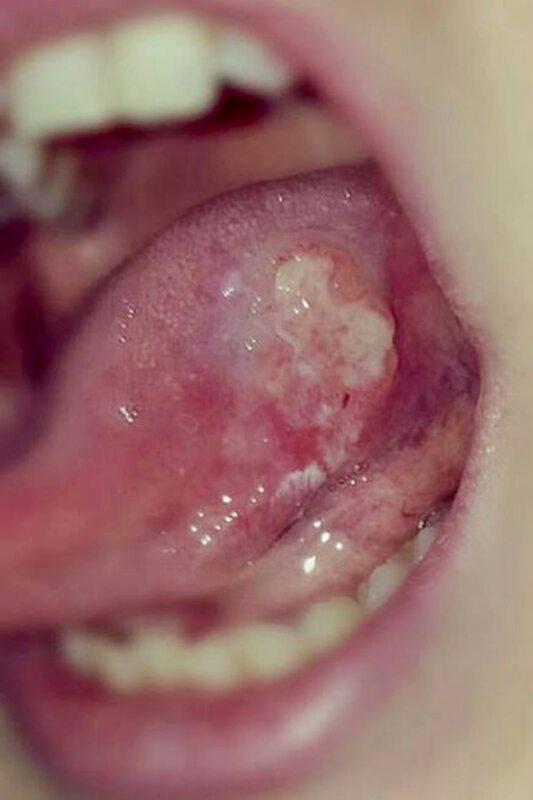 A young Shrewsbury mum has undergone surgery to rebuild her tongue - using muscle and skin from her arm - after a deadly cancerous ulcer ravaged her mouth. Liz Marsh, 28, is finally smiling again after having part of her tongue removed and rebuilt in a bid to save her life. After first detecting an ulcer, Liz claims her worries were dismissed by doctors who thought the small mass was harmless. But just four weeks later, after being referred for further tests by her dentist, Liz's ulcer had tripled in size and she was diagnosed with mouth cancer. Liz needed urgent surgery to remove the ulcer – which by now had ravaged her tongue and was causing her agonising pain. After having skin, muscle arteries and veins taken from her arm, surgeons removed a third of Liz's tongue and rebuilt it within the same 14-hour surgery. Despite having to relearn to talk, eat and smile, Liz could not be happier she has beaten the aggressive form of cancer. Mum-of-one Liz, said: "I was shocked when surgeons explained that skin, muscle, veins and nerves from my arm would rebuild my tongue. "When I first spotted the ulcer in my mouth I thought nothing of it but when it started to become painful and grew, I raised my concerns to my dentist. "They told me to come back in four weeks and after visiting my doctor, it was dismissed as being a harmless ulcer. 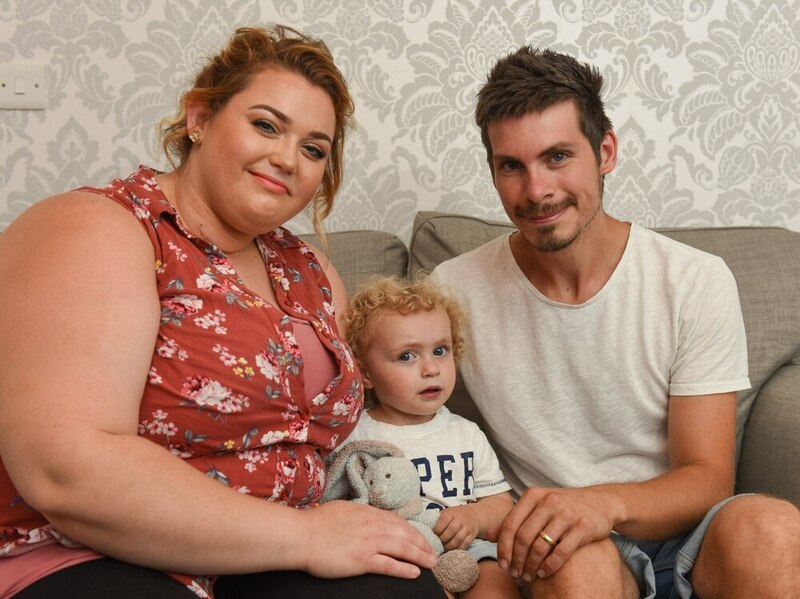 "My son, Charlie, now two, had undergone heart surgery at the time and we all thought it was stress related. "But my dentist referred me for tests and a few weeks later I had a biopsy. "I was told just over a week later that I had mouth cancer, by which point the ulcer had turned black. "Thankfully my consultant at Princess Royal Hospital in Telford was amazing and he reassured me that I could be fixed. "For months after my surgery I struggled to smile as my mouth felt numb but now I'm embracing my imperfections." Liz had the ulcer on her tongue removed along with 58 lymph nodes in her neck – known as a neck dissection – to ensure the cancer hadn't spread. 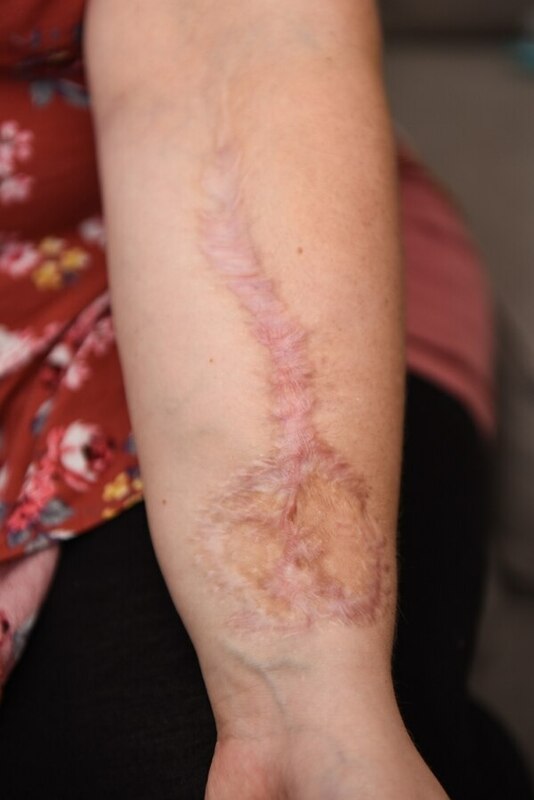 She added: "I knew I would have a few scars after the surgery but I was determined to get through it. "I had a lot of muscle and veins removed from my arm so they could help rebuild my tongue. "It was a complex surgery but I was out of hospital 11 days later. "I had been fed through a tube for the entire time I was in hospital and I had to try and relearn to eat once I left. "I also needed speech and language therapy, as part of my tongue was removed. "It was all really swollen for a long time but eventually I started to enjoy eating again." Liz was initially diagnosed with mouth cancer in October 2016 but has since undergone further surgery just two months ago. She added: "My new tongue was quite bulky so I needed it to be trimmed back once all the swelling had settled. "It has been over 18 months since my first diagnosis and I have opened up on social media about how it has affected me mentally. 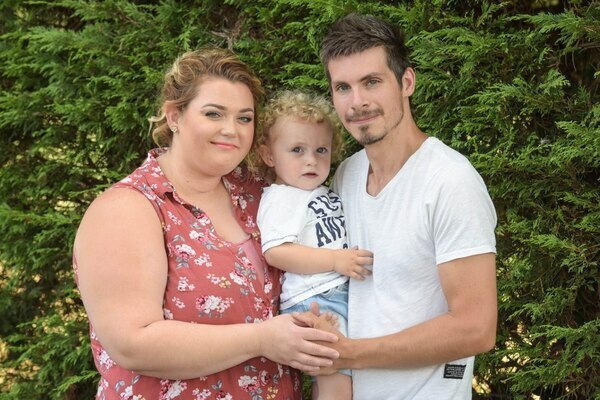 "I have documented my story online and despite having a really supportive husband, James, 33, it's impossible not to feel different after being diagnosed with cancer. "I hope being open with my story helps others seek help, if it saves one person’s life then it's worthwhile. "If you have an ulcer, white patches or a lump in your mouth then make sure you get it checked." Liz believes she is one of the youngest people in the UK to be diagnosed with mouth cancer – another reason why she feels it's important to share her story. She said: "Doctors were all shocked when I was diagnosed as I was so young but it shows it can happen to anyone. "Due to my age I have recovered well from surgery and hopefully I will remain cancer free for the next few years so I'm given the all clear. "I currently have check-ups every eight weeks but this will be extended the longer I'm in remission. "I'm so thankful to have a second chance and I know my positive attitude has helped ensure I beat cancer. "Me and James have had a tough couple of years but it has made us stronger than ever." Mr Sunil Bhatia, consultant oral and maxillofacial surgeon at The Shrewsbury and Telford Hospital NHS Trust, said: “Elizabeth presented with a large growth on her tongue that had to be removed and then reconstructed to allow her to eat, swallow and talk again. "To do this we took a flap of skin, along with its arteries and veins, from Elizabeth’s arm and plumbed it into branches of the carotid artery and jugular vein, using incredibly fine sutures under a microscope. "This type of operation can take between eight and 12 hours.